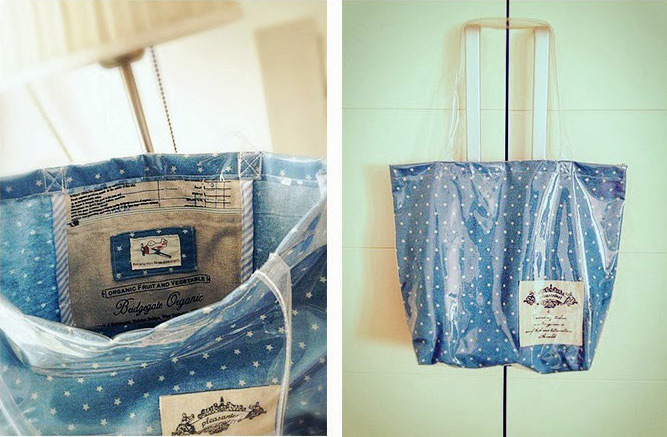 Waterproof Tote Bag Tutorial ~ DIY Tutorial Ideas! Fabric for liner 38x76cm, Plastic cloth for outer 38x73cm, Fabric for inside pocket 18x35cm, 2 pcs of plastic bag strap 4x55mm, zipper, Bias tape, Roller presser foot, Woven label & ornaments. 1. 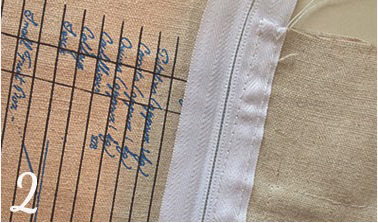 Sew woven label on fabric for inside pocket, then sew zipper with a 0.7cm seam allowance on it. 2. Sew another line at 0.7cm from the line you sewed on the zipper. 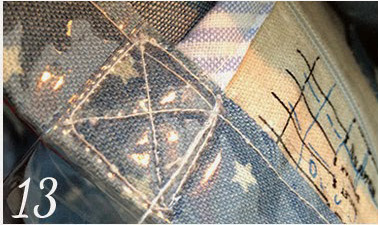 In this way, raw edge of inside pocket will be hiden perfectly (use the same way to sew the other half of the zipper). 3. After you sewed the zipper, put fabric into bias tape and start quilting (tucking the raw edge of bias tape inside), finish the other edge, inside pocket is ready now. 1. Put a fabric pattern to decorate the liner, then change to Roller presser foot. 2. Folding the short edge of liner over twice of 2cm width and iron it. put the plastic cloth on top of the fabric. 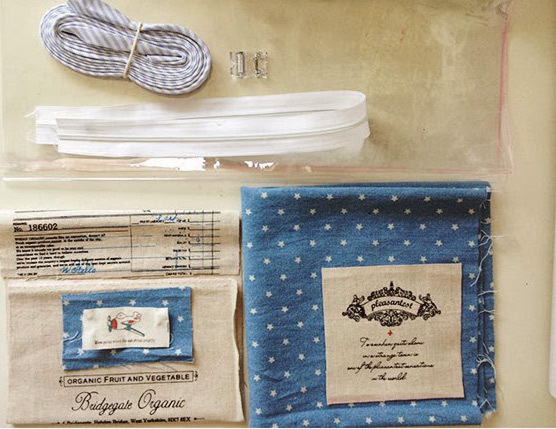 Fold the short edge of plastic cloth of 2cm width, and insert the edge of fabric inside. 3. Using small clips to fix plastic cloth. 4. 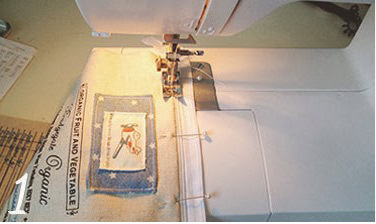 As pictured above, sew the liner and plastic cloth together (same for the other edge). 5. Fold the liner with plastic cloth right side together smooth the plastic cloth between the liner and fix them with small clip, then sew them together. 6. Pin the sewed edge with bias tape, sew the binding to the edge (same for the other edge). 7. 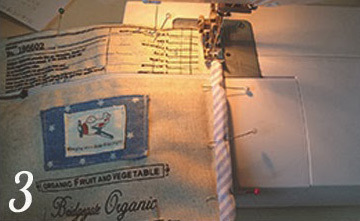 Fold the bottom corners, match bottom seam line to side seam line, make a flattened triangle, mark off a length of 10cm. 8. Sew this straight line. 9. Cut 0.7cm out from the seam, cut off the triangle, pin the cut edge with bias tape. 10. Sew the bias tape to the cut edge (same for the other corner). 11. As pictured above, fold the strap in half and sew a straight line along the edge, do the same with the other strap. 12. 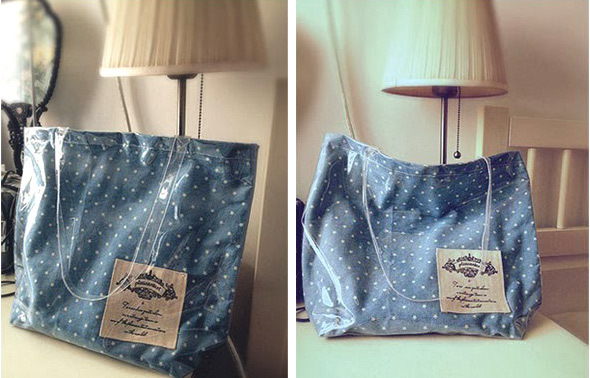 Sew straps to the bag from inside, by sewing around a square, on the end then sew from corner to corner of the square. 13. Sew all the ends to the bag like this, now it's finished!